The anatomy of the perfect post varies from blog to blog. Regardless, it’s difficult to deny that a truly remarkable post, one that warrants social shares, tons of traffic and establishes authority for your business, takes some serious thought and legwork to craft. Unfortunately, many bloggers today focus on the now rather than considering timeless topics and posts that will truly set them apart from the competition in the long-run. Neil Patel’s guide to starting a blog notes the need for bloggers to cover a wide range of topics, focusing on what readers are most passionate or excited about. Likewise, Patel suggests topics which work to solve common problems of your readership. While modern bloggers are expected to be trendy and topical, consider the benefits of crafting the occasional piece of evergreen content as means of helping out your audience and establishing search engine dominance. 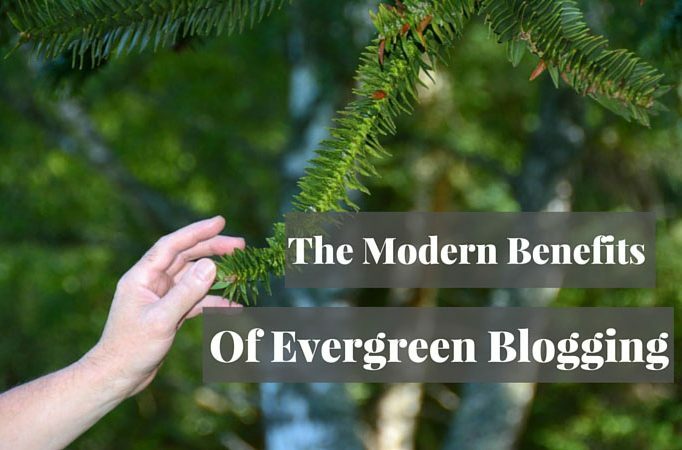 Evergreen content has existed within the blogosphere forever, long before it became a buzzword. The concept of evergreen content is relatively straightforward. In short, evergreen content represents articles and blogs which will maintain their relevance and usefulness to readers months or perhaps even years after being published. Ideally, all of our blog content should be relevant to our readership, right? Of course. However, much of today’s content has a relatively short shelf-life, especially as many marketers attempt to hop on the “viral” bandwagon. For example, a meme mentioned in your post tomorrow will probably fall flat on readers four years from now. Likewise, a how-to SEO guide from 2010 is likely filled with outdated information and irrelevant statistics due to the ever-evolving nature of Internet marketing. On the flip side, many bloggers experience the phenomenon of seeing their evergreen pieces become their most popular posts in the long-run due to their SEO potential. How so? Evergreen content isn’t about hype; instead, it’s about providing value to users and beefing up your organic search strategy. While evergreen content shouldn’t necessarily be the cornerstone of your company blog, consider crafting the occasional evergreen piece as means of building your business for the long-term. With a bit of planning and creativity, just about any-sized blog can take advantage of evergreen content, regardless of niche or industry. Now, the big question remains: how do I craft evergreen content to ensure readers and link juice for years to come? First and foremost, evergreen pieces do not rely on trends as means of relevance; instead, they rely on useful information, often targeted at newbies. Simply put, anything mentioned in an evergreen blog shouldn’t seem foreign to readers five years from now. Oftentimes, we turn to Google when we’re hungry for answers. Most of our Google results bring us to blogs, and therefore bloggers are expected to teach visitors. Specific in terms of scope, ensuring that you’re adequately covering your topic and providing visitors with something of value. Especially in the Internet marketing sphere, it’s often difficult to come up with evergreen topics because technology and software are constantly evolving. For example, lengthy articles discussing how to setup a WordPress blog on a webhost from three years ago may now be obsolete as many hosts have introduced single-click integration. Each of the aforementioned articles has the potential to reach and resonate with future readers, even if they were written years ago. Wait. Doesn’t that defeat the whole purpose of this whole “evergreen” thing? Shouldn’t the article be able to stand on its own without revisions? Considering the SEO benefits of revising content, including providing more relevant to users and the potential to target more keywords, there’s no harm in updating a piece if it’s beneficial to your readership. Updating such content is common practice and further shows your willingness to help out readers by keeping your content fresh. While you shouldn’t feel required to update your evergreen articles, there’s absolutely no harm in surveying your content to see if there’s anything that could be revised to better benefit your readership and boost your blog’s relevance in the eyes of Google. Evergreen content can play an integral role in your blog’s content strategy. Consider brainstorming evergreen topics for your next blog post, whether you’re looking to establish yourself as an authority or boost your rankings in the SERPs. Carmelo Hannity is a professional content marketer and business consultant residing in Miami, FL. She blogs about social media, entrepreneurship, business, blogging, and design. She’s been published on the Huffington Post, Business.com, and many other websites. You can reach her on LinkedIn or Twitter.